Originally published in Evrensel, 11/23/2018. 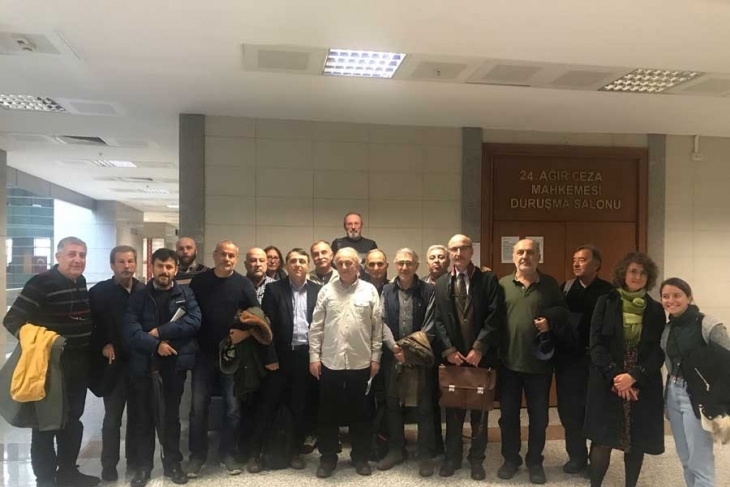 The cases of four academics being tried on the charge of “making terrorist organization propaganda” for having signed the declaration headed ”We will not be party to this crime” were heard at two separate courts. Three academics appearing before the judges at Istanbul Serious Crime Court No 36 were each sentenced to fifteen-month jail terms. The prosecutions continue of academics who signed the peace declaration headed ”We will not be party to this crime” seeking an end to rights violations and ongoing conflict at the time of curfews in the Kurdish provinces. Assistant Professor Dr M.T.T., whose second hearing was heard at Istanbul Serious Crime Court No 26, submitted a defence. M.T.T., an academic at Mimar Sinan Fine Arts University, stated that the peace text bearing the assistant professor’s signature was more “innocuous” than the implementations in the solution process. Following M.T.T., the academic’s lawyer Mehmet Fatih Kayagil addressed the court. Criticizing the indictment, Attorney Kayagil spoke of the existence of material errors. Submitting to the court the “ASDER-ASSAM report at the stage reached by the peace process” published in 2015, Kayagil noted that there were sentences favourable to the PKK in the report in which quotes by figures such as Bülent Arınç, Yiğit Bulut, Mehmet Metiner and Beşir Atalay were also included. Kayagil stated that Mesut Akgün wrote an article in Star newspaper in 2015 and made the pronouncements “Turkey must give arms aid to the PKK” in this article, and this article is still present on the site. At this, presiding judge Yusuf Yılmaz noted the name of the newspaper and the journalist who made the report, asking for them to be repeated. Noting that no investigation had even been launched into the authors of the ASDER-ASAM report and the said article, Kayagil continued, “We respect freedom of thought and expression and we are most certainly not calling for an investigation to be launched against these people. We simply think that, with proceedings initiated over this declaration in which the same words appear, the scales of justice have erred.” The court bench ordered the joinder of the case with the other academics’ cases before it. Elsewhere, the trial of three academics was heard at Istanbul Serious Crime Court No 36. The first hearing at the Serious Crime Court was that of Istanbul University faculty member Güven Gürkan Öztan. At the previous session, Öztan’s lawyers Sevgi Kalan Güvercin and Ali Deniz Ceylan had sought the recusal of the bench. Presiding judge Hakan Özer said Serious Crime Court No 37 had dismissed the application for recusal. The hearing prosecutor repeated his recommendations on the merits and sought Öztan’s imprisonment for “making organizational propaganda.” Rejecting the charges, Öztan asked to be acquitted. One of Öztan’s lawyers, Sevgi Kalan Güvercin, stating that the material elements of the offence had not been constituted, said with examples from European Court of Human Rights rulings that the action had to be treated as an instance of freedom of expression. Setting out with a reference in his defence to the words of his colleague İnayet Aksu, Attorney Ali Deniz Ceylan for his part said, “We see in these proceedings that unfortunately the words of the defence are not equal to the words of the prosecution.” He stated that the charges were not supported with hard evidence, while they as the defence had compiled pages of defence in a detailed manner. Passing sentence, the bench handed down a fifteen-month jail term to Öztan. It deferred sentencing. The second hearing at Serious Crime Court No 36 was that of Prof. Dr Gülhan Türkay. Speaking with regard to the merits, Gülhan Türkay indicated that she did not accept the charges and asked to be acquitted. Türkay did not wish for deferral of sentencing provisions to be applied if the court passed sentence. Türkay’s lawyer Emel Ataktürk also called for her client’s acquittal. The court bench handed down a fifteen-month sentence to Türkay. The court, unable to implement deferral of sentencing provisions in the absence of the accused’s consent, suspended the sentence by placing Türkay on two years’ probation pursuant to Article 51/3 of the Turkish Penal Code on the grounds that, “the accused has no criminal record and the intimate conviction was formed that she would not recommit crimes if the sentence were suspended in view of her past demeanour.” It imposed no obligation on the accused as per paragraph six of the same article. As to the form, probation will take, the Probation Office will decide. Should Türkay commit a crime while on probation, the imposed sentence may be partially or fully applied? As to the final hearing at Serious Crime Court No 36, this was that of Marmara University‘s Prof. Dr Rıza Türkay. Asking for his acquittal, Türkay consented to deferral of sentencing provisions being applied if there was a sentence.